IDC reported in its latest market study findings, Apple shipped a total of 3.6 million units in the second quarter of 2015 (2Q15), just 0.8 million units behind Fitbit's 4.4 million units. Total shipment volume for the quarter came to 18.1 million units, up 223.2% from the 5.6 million units shipped in 2Q14, according to IDC. "Anytime Apple enters a new market, not only does it draw attention to itself, but to the market as a whole," noted Ramon Llamas, Research Manager for IDC's Wearables team. "Its participation benefits multiple players and platforms within the wearables ecosystem, and ultimately drives total volumes higher. Apple also forces other vendors – especially those that have been part of this market for multiple quarters – to re-evaluate their products and experiences. Fairly or not, Apple will become the stick against which other wearables are measured, and competing vendors need to stay current or ahead of Apple. Now that Apple is officially a part of the wearables market, everyone will be watching to see what other wearable devices it decides to launch, such as smart glasses or hearables." Apple's arrival had the greatest impact on the smart wearables category, or those devices capable of running third party applications. "About two of every three smart wearables shipped this quarter was an Apple Watch," said Jitesh Ubrani, Senior Research Analyst for IDC Mobile Device Trackers. "Apple has clearly garnered an impressive lead in this space and its dominance is expected to continue. And, although Fitbit outshipped Apple, it's worth noting that Fitbit only sells basic wearables – a category that is expected to lose share over the next few years, leaving Apple poised to become the next market leader for all wearables." Fitbit's 2Q15 results reads as a list of successes: triple-digit year-over-year worldwide volume growth; double-digit year-over-year worldwide revenue and profit growth; expanded partnerships with corporate wellness groups, fashion, and food companies; and increased visibility in the media. Fitbit resonates with customers because it has remained true to its simple value proposition of tracking fitness to encourage healthier lifestyles rather than promising the multi-purpose functionality that most smart watches have sought. Apple's first appearance in the wearables market finds it in the number 2 position overall, and well within reach of market leader Fitbit. Apple is just getting started with its Watch, having reached just sixteen geographic markets to date and starting agreements with third-party retailers. But what is most important is the continued development of the watchOS platform. At its WWDC in June, Apple announced that the next version of watchOS will allow for native applications, which could have a similar effect that iPhones enjoyed when native apps became available. Garmin's laser-like focus on fitness devices for "citizen athletes" (runners, cyclists, and swimmers) has been successful so far, though increasing competition from the likes of Fitbit and Xiaomi has led to a reduction in share. Garmin's new ConnectIQ platform may help alleviate some of the pressure as it attempts to offer access to third party applications, data fields, watch faces, and widgets to further customize its wearable devices. 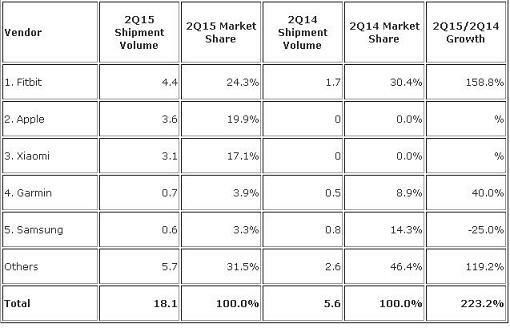 Samsung narrowly edged out Huawei and Jawbone to remain among the top 5 vendors during the quarter. The company saw sustained success with the popularity of its Gear S and Gear Fit devices, and hinted at a massively redesigned Gear S2 to be announced next month. Given Samsung's history of making its latest wearable devices compatible only with Samsung's top models and nearly exclusive reliance on Tizen, the company has limited its potential reach. Whether that trend continues with the Gear S2 will bear close observation.